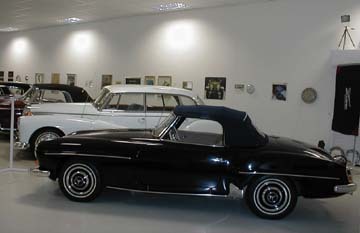 Richard Priebe went on a South African holiday and visited Mercedes-Benz enthusiast and collector, Graham van Heerden. He left North Carolina on September 19, 2004 and arrived back home October 4, 2004. 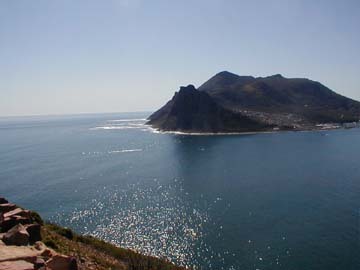 The plane rides were approximately 24 hours from North Carolina to Cape Town. This is the story and some of the photographs, which were of particular interest to the readers of this website. 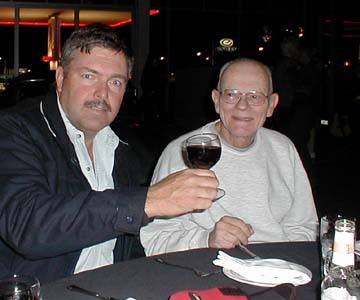 Richard Priebe passed away August 6, 2006. After several months of planning via email, I left Salisbury, NC to go to the airport in Charlotte, NC. From there to Atlanta, Georgia, then Johannesburg, then to Cape Town South Africa. Now, of course, my baggage did not arrive when I did, but I lived thru that, it arrived the next day. 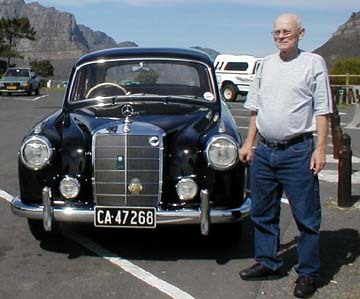 Graham van Heerden, an International Ponton Owners Group (IPOG) and MBCA (Mercedes-Benz Club of America) member met me at the airport. From there we went to his home, where I had a small apartment for my self. At supper I met his family, his wife, Teresa, an MD., Mia, then 13, and Conradie, 8. Conradie got his grandfather's name, a family name. They are delightful people, and I enjoyed my entire time with them. Tuesday and Wednesday mornings (September 21, 22) I got up and had breakfast. Then we went to Graham's place of business, where I would send off a short email to friends back in the US. 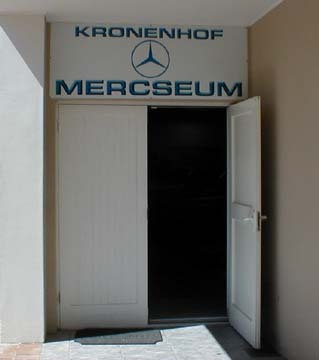 Then to the "Mercseum", which is attached to the place of business. 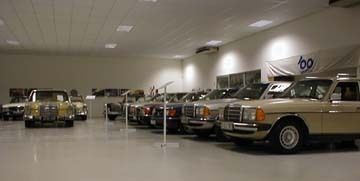 For those who don't know, Mercseum is an amalgamation of "Mercedes Museum." 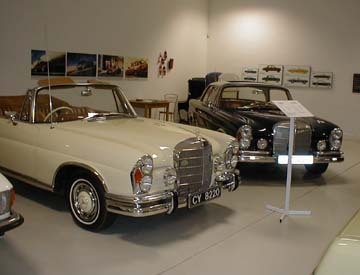 The first sight upon entering was a 1950 Type 170S. 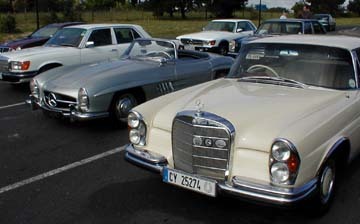 Then a row of Pontons: a Type 190b, a 219, then four 220S's, a 300 "Adenauer", then a 190SL roadster. 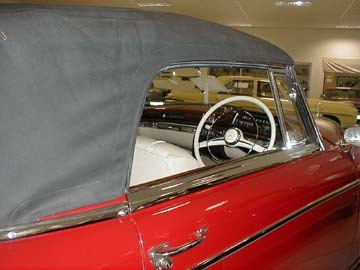 The Ponton row includes a coup and a cabriolet. 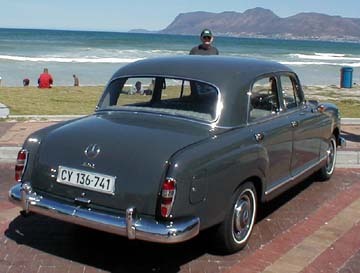 Most are right hand drive as South Africa ("Suid-Afrika" in Afrikaans) is a right hand drive country. 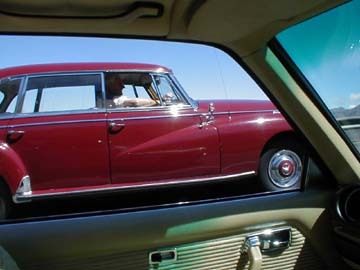 It is not driving on the wrong side of the road; it is the custom and the usual manner of doing business there as in England, Australia, Japan and elsewhere. I was told that there were plans to change the side of the road driven on, it would be in two phases, the first year only the heavy trucks would change sides! 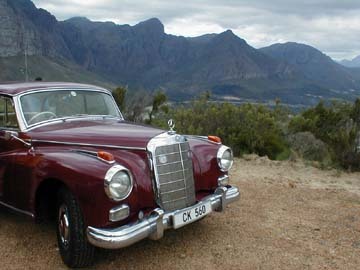 Then we went for a scenic ride in the countryside around Cape Town. The scenery is fabulous! Just a small aside here: It is really amazing to wake in the morning and go outside and hear birds one has never heard before, see plants one has never seen before, and see a beautiful area! Graham drove and we went thru the domestic wine country and stopped at several wineries. 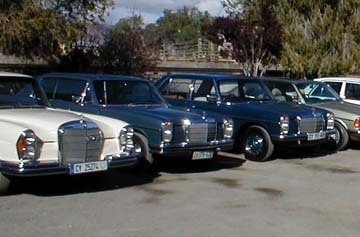 The first day we went in the 220S coup, and the photo of the coup was taken at a winery. I do not drink, and thus, did not imbibe, but I'll bet the wine was wonderful. 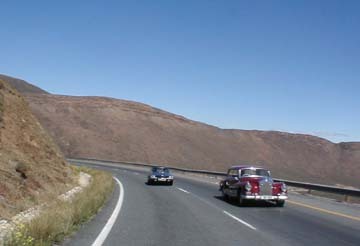 We drove for several hours those two days in the near Cape Town area, with scenery that is just overwhelming. Graham is a wonderful host and explained many things I did not understand. 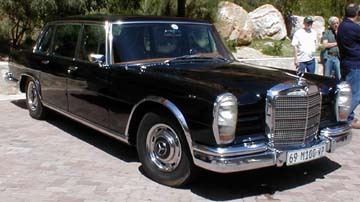 Then on Thursday morning we took his non-Ponton W123 280CE (rain was predicted), and left for a four day Mercedes-Benz Club tour. Of course we spent about an hour at the designated meeting point examining each car as it arrived, and they renewed friendships while I made new friendships. 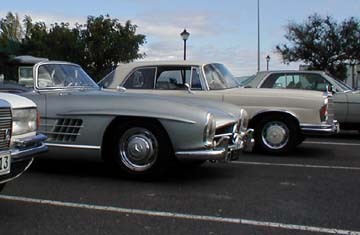 The two most outstanding cars on a tour, any tour, were the 300SL roadster and the 300 "Adenauer" sedan. At the start there were no Pontons, however. 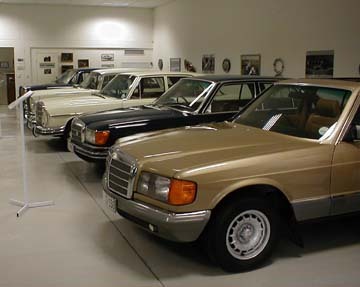 The 1982 300GD Geländawagen parked near the 300SL was quite a contrast, and wonderful to see. 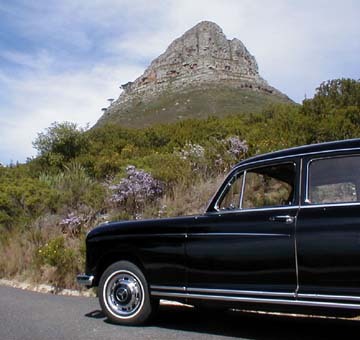 From the north edge of the Cape Town area, we headed north, through some of the most lush green farmland, beautifully kept, and obviously creating a good income. 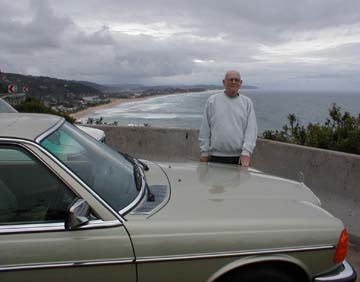 Then we went up over a rather high mountain pass and stopped at a scenic outlook and all admired the view and talked cars. Then, as we swung around to the north side of the mountains, we came to a totally different type of climate area. 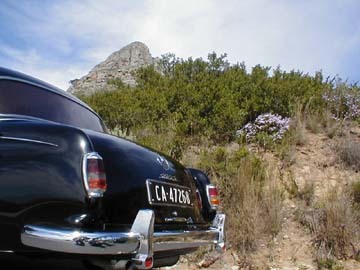 We descended into the little "Karoo." 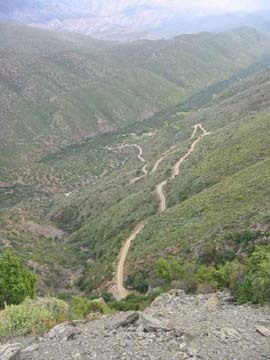 A Karoo is a broad, relatively flat valley surrounded by mountains, and in this case, highly glaciated mountains. 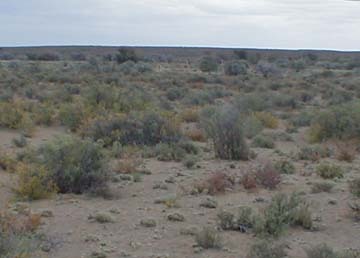 Here the vegetation is relatively sparse with lots of bare soil and rocks visible. 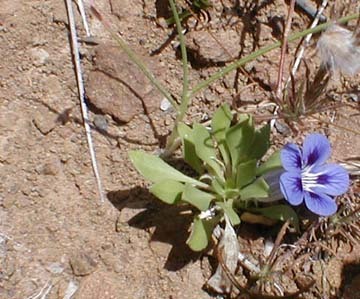 However the spring flowers were blooming: September is spring in the southern hemisphere. At several points there was the scent of the perfume of the wildflowers strong enough that it could be smelled in the cars. We stopped after about an hour or so and had tea and scones. I didn't know what a scone was, but it is a biscuit with butter, jam, and whipped cream. I drank "rooibos" tea, a tea made from a red bush, as its name indicates. Gosh that was good. 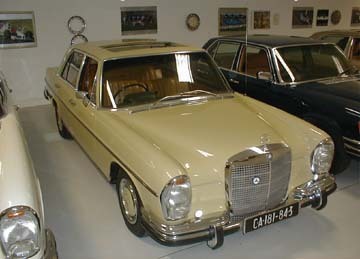 This appears to be a daily custom on Mercedes-Benz tours. Then we drove for several hours more between the mountains, which became more barren as we went, the valley floor showed more soil and rocks and fewer plants except where there was a river. The railroad tracks were visible much of the way in the distance, and several trains passed. 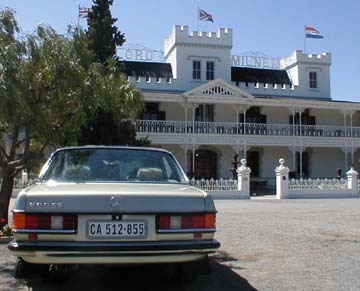 Then we stopped for lunch, and shortly for a breakdown, and then on to Matjiesfontein, where we stayed at the Lord Milner Hotel for the night. Had the prices been in dollars, they would have been high, but since they were in Rands, and the exchange rate is about 6 Rands to the dollar, they were quite reasonable. We spent the rest of the afternoon in the local museums, and one, in the basement of the old train station, was so packed with old and antique stuff, not including me, that it took many hours to see most of it. After dinner, entertainment was provided at the pub next to the Lord Milner, and it carried on for many hours. The reason I mention the railroad, is that it is about 3 foot gauge, about a foot narrower than ours here in the US. 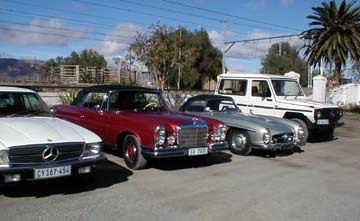 There is a picture of the cars lined up at the Lord Milner Hotel in the morning as we prepared to go the next leg of the tour. 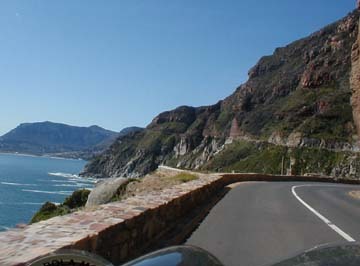 We went north to Prince Albert Road where we turned right and went toward the east coast of South Africa. 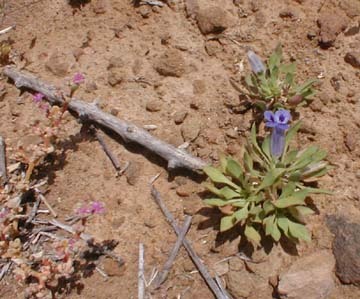 There had been less and less vegetation and more and more soil and rocks as we went north, and then east. 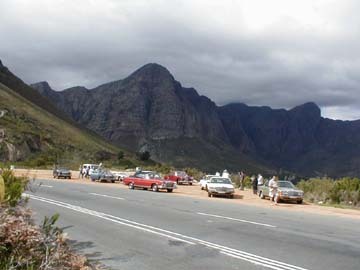 However as we went over and around some mountains, to the Meiringspoort Pass, the whole scene changed again: we came into lush green mountains and lands. At the top of the pass there is a scenic pullout and we stopped to view the scenery under threatening rain clouds and some slight sprinkles. We walked up to a waterfall, and the picture of it is by Peter Merle. 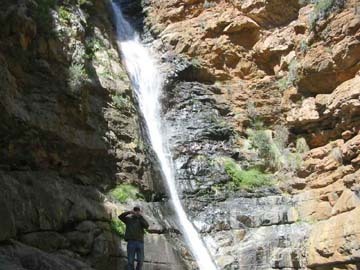 That high in the mountains one would not expect to see such a big waterfall. 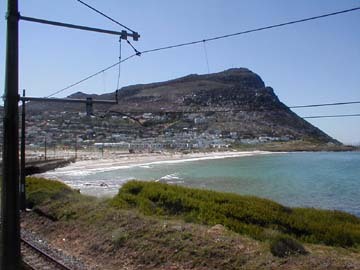 Then we proceeded east toward the coast to the city of George. I do not have the name of the Hotel we stayed at, but like the Lord Milner, it was very nice, old fashioned, but very nice. 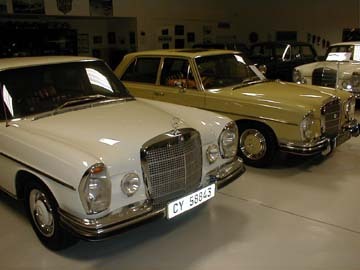 This would be Friday evening and we were invited to the home of a Mercedes-Benz Club member for what I was told would be a wine and cheese party. Well, it started out with wine and cheese. Then, as though by magic, chicken, meatballs, small finger-sized meat pies, veggie trays, and all sorts of goodies appeared. After the main course was pretty well eaten up, the desert trays appeared. What a feast! Saturday we tried to drive north east along the coast, but the traffic jams were so bad that we ate lunch at Wilderness, and I had some ostrich meat. Then back to George and to the local transportation museum. 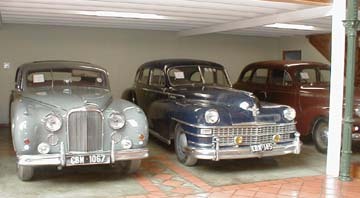 We were also invited to see several Studebakers at their owner's houses, since I am also a Studebaker owner and belong to the Studebaker Driver's Club. 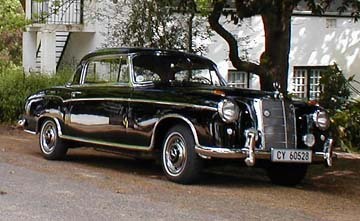 All of the Studebakers I saw, and there were about six or seven, were built in South Africa and were right had drive. 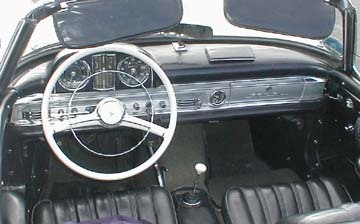 I rode in a Power Hawk for a short drive around several blocks, and the car was wonderful. 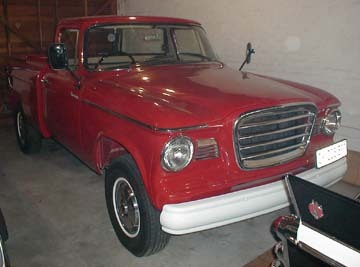 There is also a picture of a right hand drive Studebaker Champ pick-up truck. 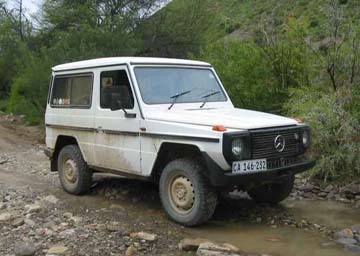 While we were sight seeing in George, Peter Merle took off and went to a secluded valley into which very few drive. 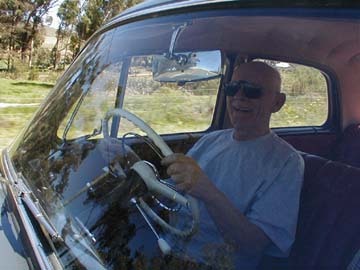 There is a picture by him of the trail he drove in his Geländawagen. The story is that during the Boer wars, a small band of Boers escaped into the valley and lived there for many generations. When found, they were all taken to institutions (due to inbreeding), and there may be a family living there now. It must have been a rough drive because Peter left and drove home shortly after his return to the group. 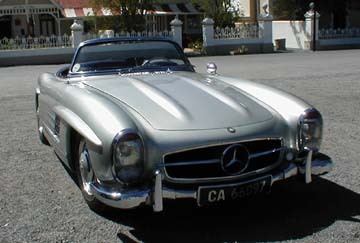 That eve, Saturday, a Mercedes-Benz dealer in George treated us to a feast. Two spit broiled lambs and all the trimmings, plus a combo, which played almost any music requested, and played so that the group could dance. They and the food were excellent. There was much wine and brandy and the group stayed for considerable dancing, drinking and enjoying the evening. 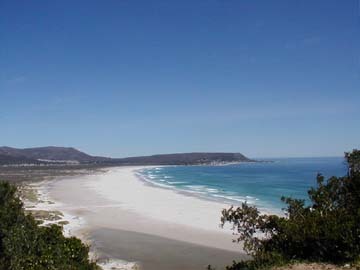 Sunday we drove back to Cape Town via another inland route, being a holiday weekend the shore route was so crowded it was not worth the try. I can never say enough about the scenery: It was stunning, majestic, stupendous, almost overwhelming. On Monday thru Thursday, our schedule was much like that of the previous week: to the office and Mercseum, and then for a tour of the countryside in a different Ponton each day. 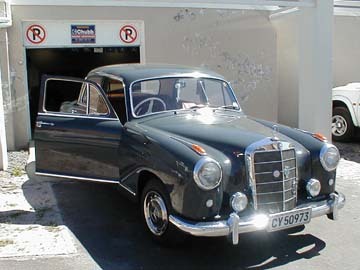 As I had ridden in Andre van den Merwe's Type 300 Adenauer, we did not take Graham's Adenauer out. 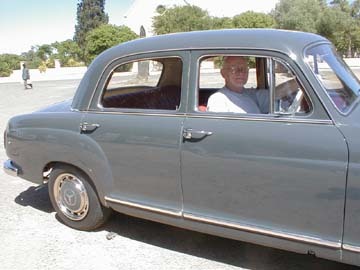 I drove the right hand drive 219 Ponton sedan a short way, but did not get the coordination of shifting with my left had down at all. 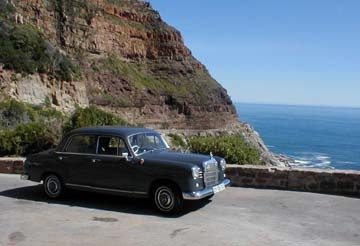 When I drove, we went to the town of Philadelphia, which is a very small town not far from Cape Town. On Friday we went up north to Nelskraal, Graham's game ranch. 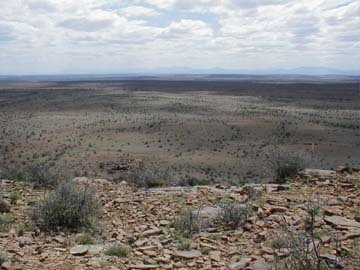 It is in the Karoo, and from the first looks, it appears to be in a very desolate area. 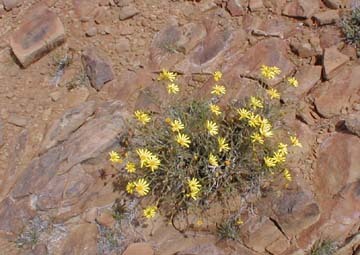 However, upon closer examination, there were little wildflowers blooming everywhere between the rocks. The land is rather flat, with mountains visible in every direction in the distance. While there, we saw blue and black wildebeests, giraffes, steinbok, and several kinds of animals I cannot remember the names of except when I forget the ones I have named. What a wonderful relaxing place! Graham has peacocks, doves, and all the wild animals there! Nelskraal is where I saw dinosaur footprints. One day we cooked and ate lunch on the top of a flat-topped hill, which I suspect we would call a butte, but there, it is simply called a flat-topped hill. How beautiful the whole place is! I must mention the lions and hyenas roaming the streets in Cape Town: there are none. 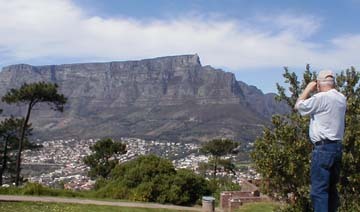 The city is clean and very well kept; all buildings are of cement as there are no timber trees to be cut for lumber. One apartment development we went into looked much like the pueblos of the Hopi. 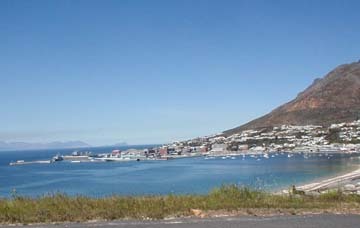 I will say that anyone having the opportunity go get to Cape Town, should do so in the spring. It is beautiful, warm, but not hot, and the flowers are blooming. 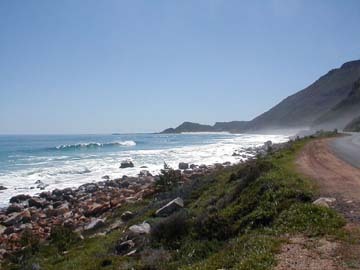 The costal route up the east coast is called the garden route and is loaded with exotic vegetation and the Indian Ocean. 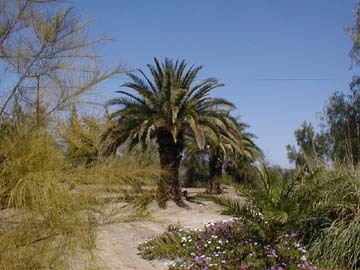 The west coast is barren desert because to the cold Atlantic current flowing north along it. No rain comes from cold water, but the east coast has a warm Indian Ocean current flowing south along it and the rain is more than sufficient. 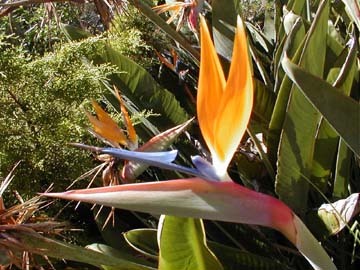 Strelitzia Reginae (also known as Bird of Paradise). Indigenous to South Africa where it grows wild in the eastern Cape. 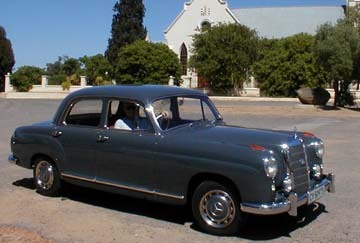 Graham's 1958 Type 220S coupé at a winery. 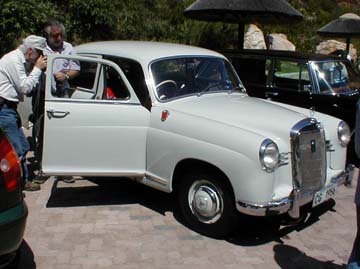 South African Pontons are fitted with small reflectors under the headlamps where the turn indicators would be found on US models. 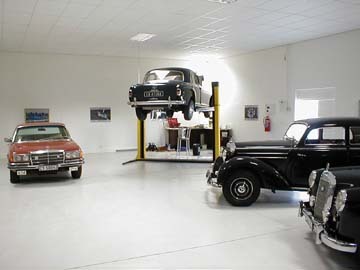 The entrance to Graham van Heerden's impressive Mercedes-Benz collection. 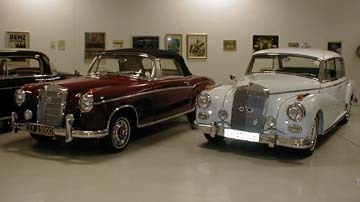 For those who don't know, "Mercseum" is an amalgamation of "Mercedes Museum." 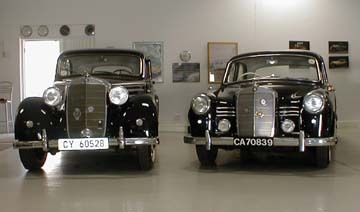 1950 Type 170S (left) and 1955 Type 180 Ponton sedan with a "side valve" or "flat head" gasoline engine which was used in the first Pontons until the overhead cam engine was ready. 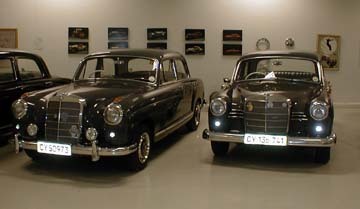 The Mercseum with the 220S sedan on a lift. 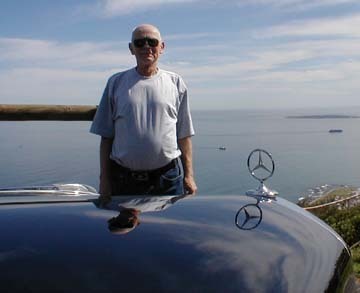 The photo was taken in 2003 by Graham just after his new building was completed. 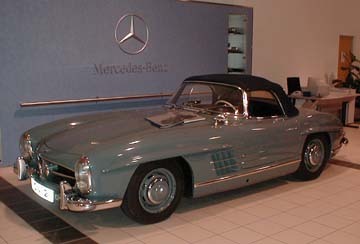 The 300SL roadster (W198 II, 8/57-2/63) was an encore performance to the 300SL "Gullwing" coup (W198 I, 8/54-5/57). 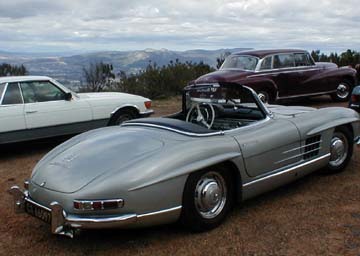 Together, they make up two of the most distinguished sports cars in automobile history. 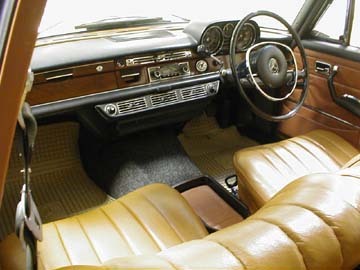 Type W186 300d sedan (RHD) with myself in the passenger seat (left side). Photo by Graham. 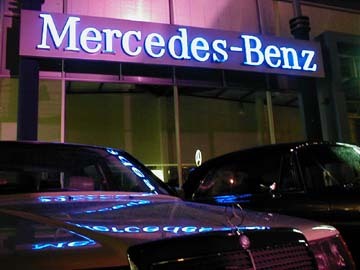 The Mercedes-Benz dealer in the city of George who put on the feast for the tour group. Two spit roast lambs and all the trimmings. Delicious, delightful and delectable! 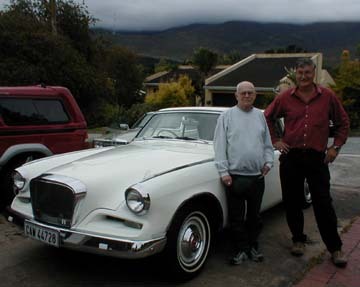 We were also invited to see several Studebakers at their owner's houses, since I am also a Studebaker owner and belong to the Studebaker Driver's Club. 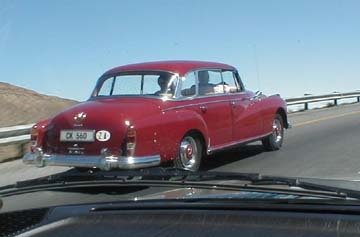 All of the Studebakers I saw, and there were about six or seven, were built in South Africa and were right had drive. 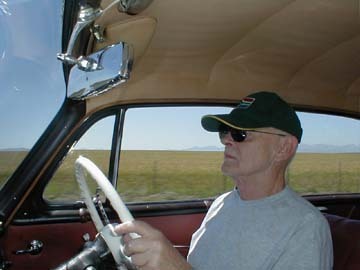 A 1961-62 Studebaker Champ "bakkie" (pick-up) owned by Bill Tolken. 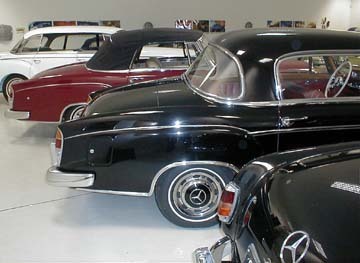 The fin at the bottom right of the photo belongs to a Studebaker Hawk (1957-1962). Since my camera broke, this was the only shot I got from the museum at Matjiesfontein. 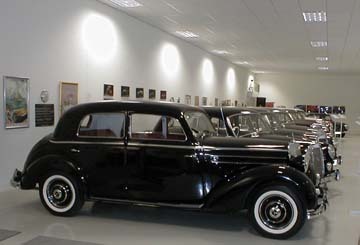 Note the right hand drive 1948 Chrysler. 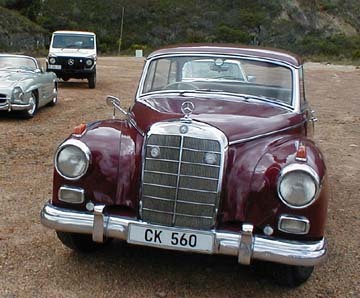 The 219 sedan was absolutely beautiful, as were all cars in Graham's "Mercseum"
The Karoo. From the first looks, it appears to be a very desolate area. 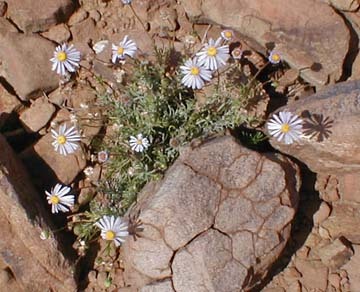 However, upon closer examination, there were little wildflowers blooming everywhere between the rocks.